Welcome to Premier Vision Group! Offering comprehensive eye health services for all members of your family, we know how much your eye health and appearance means to the quality of your life. Dr. John Archer, Dr. Cheryl Archer, Dr. Mile Brujic, Dr. Christa Heckman, Dr. Brian Dietz and our staff are committed to excellence and serving your complete eye care needs. Visit us at Premier Vision Group to find the latest in fashion eyewear and lens technology. Our experienced staff looks forward to helping you find the best pair of eyewear or contact lenses to meet your visual needs. If you are new to our website, we invite you to explore and discover all there is to learn about your vision. We look forward to welcoming you in our office at Premier Vision Group soon! Dr. Cheryl Archer receives the Ohio Optometric Foundation Humanitarian Award! 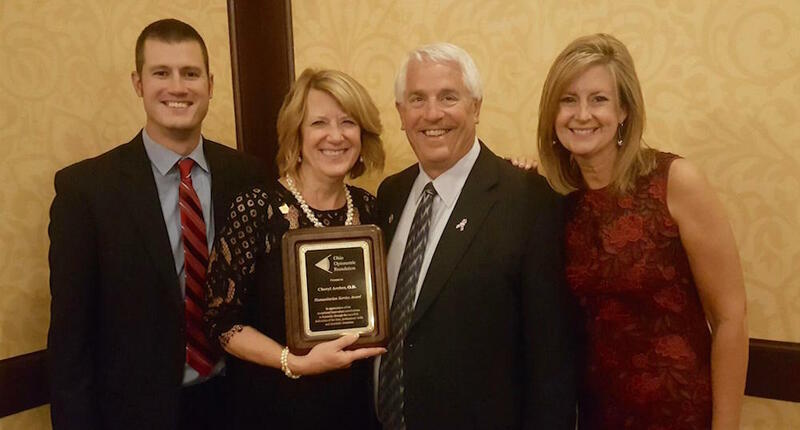 Dr. Cheryl Archer recently received the Ohio Optometric Foundation Humanitarian Award at the Ohio Optometric Association's 2016 President's Banquet in Cleveland. Pictured at the award ceremony are Dr. Brian Dietz, Dr. Cheryl and her husband Dr. John Archer and Dr. Tracey Needham. Congratulations Dr. Cheryl and thank you for your hard work and compassion for others!